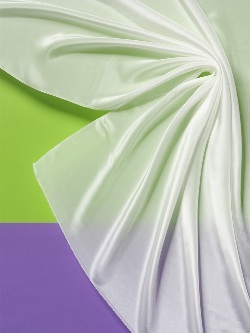 This is the lightest quality of the Crêpe de Chine fabrics. It has a smooth surface and an elegant shimmer. Additionally, Crêpe de Chine is also extremely wrinkle resistant due to its especially elastic yarns. This silk is very suitable for light blouses and tunics and makes an unbeatable base for all kinds of silk painting and tie dyeing. PLEASE NOTE This is the same weight as Habotai 8 but is of a different weave construction and has more of a sheen - some customers get them confused.